Tuk, a syncretic fife and drum tradition of Barbados, may have roots stretching back to the first stationings of British troops there in the 17th century; it was the music of the black plantation slaves until Emancipation in 1838. Two specific functions for tuk developed subsequently: as entertainment for the working classes and as the music of Landship, a music and dancing society. 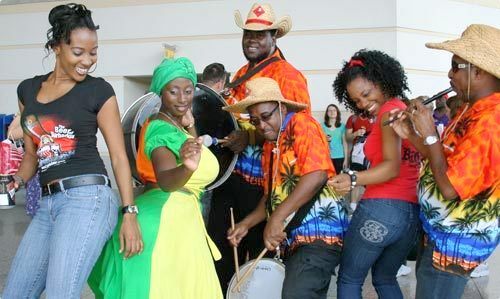 The tradition declined during the 20th century due to several cultural factors, but a revival began in the 1970s, and in the 1990s the government started to promote tuk as a uniquely Barbadian tradition. This according to “Tuk music: Its role in defining Barbadian cultural identity” by Sharon Meredith (European meetings in ethnomusicology VIII  pp. 16–25). Above, a tuk band and their stock character Mother Sally interacting with their audience; below, a tuk band at a local festival, first in a parade and later joined by dancers (ca. 4:50).